« Mobile – a major shift are you ready? Think about colour! Everywhere in life you’re bombarded with colour. Colour shouldn’t just be restricted to what you can see but used to really bring your website to life. The way you use colour is important. So pick picking a great colour scheme is something to put some effort into. This post explains how to pick an effective colour scheme. A colour scheme is a series of complementary colours that you will use in your site. So rather than have everyone design their own page with the colours that they like, you pick a set of colours for everyone who updates the site to use. This includes finding photos that have those colours in them! When thinking about a colour scheme for your site a good place to start is with your logo. It’s likely that your logo will appear on every page so the colour scheme will need to at least match that of the logo. There are lots of other sites but I’d recommend this one. Colour 1 (see arrow) changes to match that colour. 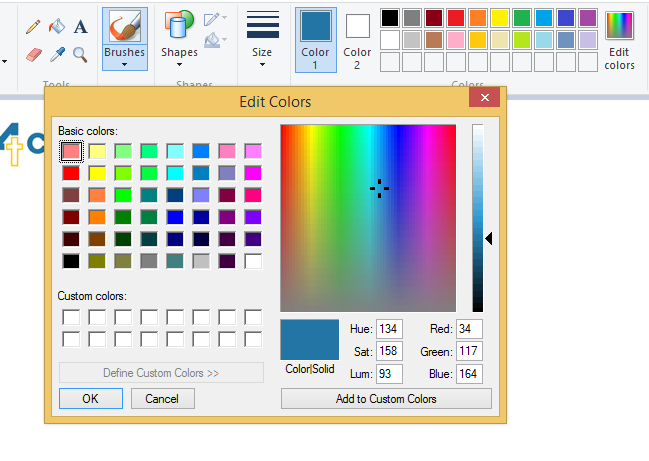 Next click on the edit colours and you’ll find the Red, Green and Blue colours ( in this case 34,117, 164) which you can convert using a website like https://www.easycalculation.com/colorconverter/rgb-coder.php to an Html colour. Now you have your core colour return to the colour wheel site and put that html colour in as the main colour. You’ll now be given a set of colours that match and you have your basic colour scheme. I generated the scheme shown using our website logo colour and the analogic option. If this was your site then this would be the colour palette for it. Our site does use some of these colours but we use other colours too. If you’d like to know why then please give us a call. Get your core colour from your logo. Next put it into a colour wheel site. Pick an option that generates a set of colours you like. 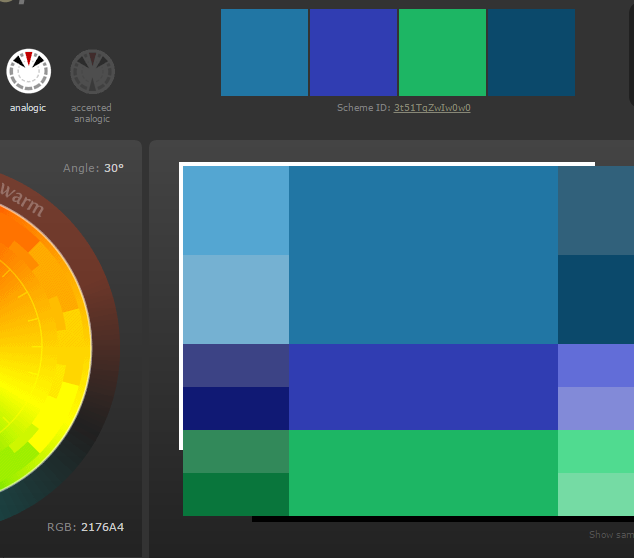 Grab and publish the colour palette. It’s really easy and pretty straightforward to build a site colour scheme. Once you have the scheme add it to the site style guide and make sure you give it to anyone who is producing content for the site. If you do this you’ll find that you build a Website that remains consistent in look and is pleasant for your visitors to look at.